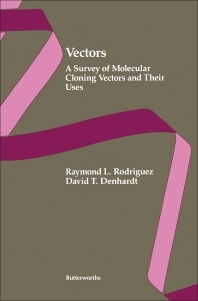 Vectors: A Survey of Molecular Cloning Vectors and Their Uses focuses on the functions of molecular cloning vectors. The book first discusses bacterial plasmid pBR322. Topics include criteria for plasmid vector design, construction and structure, transcriptional signals, DNA replication, recombination, mobilization, and plasmid stability. The text also examines bacteriophage lambda cloning vectors; filamentous phages as cloning vectors; chimeric single-stranded DNA phage-plasmid cloning vectors; and phage-plasmid hybrid vectors. The selection discusses cosmids and plasmid positive selection vectors, including library and construction, cosmid rescue, and positive selection vectors using plasmid-encoded lethal function. The text also examines vectors for regulating expression of cloned DNA, including lambda promoters, secretion vectors, and protein fusion vectors. The book takes a look at vectors with adjustable copy numbers. Copy number and protein production; adjustable copy number vectors; future expression vectors; rate-limiting steps of protein production; and promoters and ribosome binding sites are explained. The text puts emphasis on vectors for the synthesis of specific RNAs in vitro and cloning vectors for gram-positive bacteria. The selection is a valuable source of data for readers interested in molecular cloning vectors.